I'm in love with Flickr. Seriously, I was hooked when I first saw it. I love sharing all my photos and being able to keep tabs on my friends through their pictures. 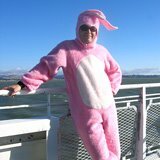 I've recently discovered Flickr Friends (formerly Flickr Stalkr). 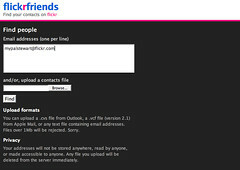 A super easy way to find all your friends on Flickr. Just upload your address book and it shows you all the folks that have accounts. Good stuff!! Source: Thomas Hawk's Top 10 Hacks on Flickr.